When disaster strikes, people expect their insurer to be there for them—no ifs, no buts. To deliver reliable customer services, IT systems must always be available. With a data protection and recovery solution from IBM deployed with help from SVA, W&W-Group is ready for whatever tomorrow may bring. Customers count on their insurer when things go wrong—so a rapid, reliable response is vital. To ensure it always delivers, W&W-Group wanted to recover quickly in the unlikely event of IT disaster. W&W-Group deployed a highly-available backup solution based on IBM Storage systems and IBM® Spectrum™ technology with help from SVA, enabling backup, storage and recovery of critical data. With data protection and availability requirements rising, W&W IT continually assesses its infrastructure. As a result of these proactive reviews, the company decided to take advantage of software-defined storage and flash technology to improve scalability and speed. In this case, this was done with help from IBM and IBM Business Partner SVA System Vertrieb Alexander GmbH (SVA). W&W-Group implemented a flexible, high-performance backup cloud solution based on IBM Spectrum Protect™, IBM Spectrum Scale™, IBM FlashSystem® 900 and IBM Storwize® V7000 solutions, connecting the new systems to its existing IBM TS3500 Tape Library. “We have worked with both IBM and SVA for many years,” says Michael Mehrens. “As we’ve come to expect from both teams, support has been excellent and everything ran smoothly during the implementation phase.” Multiple IBM Spectrum Protect instances, deployed across two data centers, back up mission-critical databases and application servers in parallel, and store the data in IBM Spectrum Scale, a clustered scale-out file system. In the event of disaster at one location, the IBM backup solution fails over to the second site much faster than in the past, ensuring rapid recovery and complete data protection. 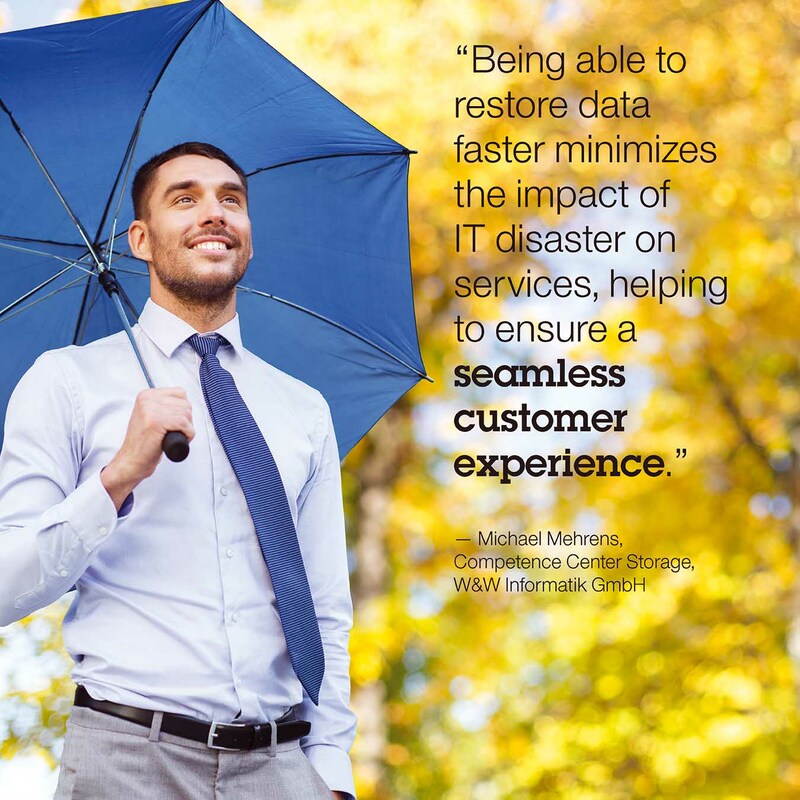 Michael Mehrens remarks: “We use the IBM solution to backup 2,000 systems and applications. This includes everything from our most critical database instances that power our SAP applications, to the application servers, our IBM WebSphere® solutions, file servers, and mail server. The backups also cover large IBM AIX® systems, which run our SAS data warehouse. We back up 50 to 60 TB of data with the IBM Spectrum Protect solution daily. In total, we store around 8 PB of backup data mostly on tape." Wüstenrot & Württembergische AG (W&W-Group) is a publicly-held company headquartered in Stuttgart, Germany. The financial service provider is active in two business segments: building society savings and insurance. W&W-Group delivers the four building blocks of modern financial security: insurance, home ownership, risk protection and asset management. Its central IT service provider, W&W Informatik GmbH (W&W IT), manages the group’s IT applications, data centers and network. Based in Ludwigsburg, W&W IT employs around 950 people. © Copyright IBM Corporation 2017. IBM Systems, 1 New Orchard Road, Armonk, New York 10504-1722 United States Produced in the United States of America, May 2017. IBM, the IBM logo, ibm.com, FlashSystem, Spectrum Protect, Spectrum Scale, WebSphere, AIX, POWER, and Storwize are trademarks of International Business Machines Corp., registered in many jurisdictions worldwide. Other product and service names might be trademarks of IBM or other companies. A current list of IBM trademarks is available on the web at “Copyright and trademark information” at ibm.com/legal/copytrade.shtml. This document is current as of the initial date of publication and may be changed by IBM at any time. Not all offerings are available in every country in which IBM operates. THE INFORMATION IN THIS DOCUMENT IS PROVIDED “AS IS” WITHOUT ANY WARRANTY, EXPRESS OR IMPLIED, INCLUDING WITHOUT ANY WARRANTIES OF MERCHANTABILITY, FITNESS FOR A PARTICULAR PURPOSE AND ANY WARRANTY OR CONDITION OF NON-INFRINGEMENT. IBM products are warranted according to the terms and conditions of the agreements under which they are provided. Actual available storage capacity may be reported for both uncompressed and compressed data and will vary and may be less than stated.